Royal Caribbean offers cruises out of Cape Liberty (New Jersey) to the Caribbean, the Bahamas, Bermuda and New England & Canada. These are casual, affordable cruises on huge modern ships. Scroll down for the full schedule. 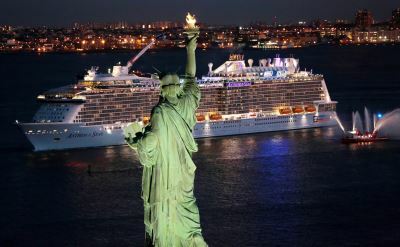 The video below is a quick 2 minute introduction to the Anthem of the Seas, which sails out of NJ. 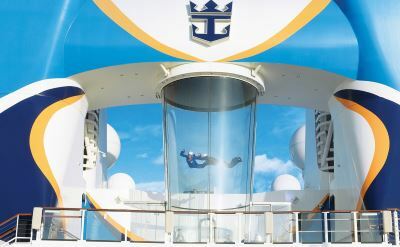 The Royal Caribbean Anthem of the Seas features the RipCord sky-diving simulator, North Star capsule ride, Seaplex fun park, FlowRider surf simulator, Two70 aerial shows, Vitality Spa, adults-only glass-canopied Solarium pool, Adventure Ocean youth program, H20 Zone kids water park, and family-friendly interconnecting staterooms. "Dynamic Dining" gives you more choices and control over where and when you eat. 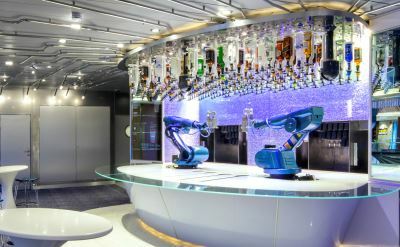 Find out about 7 "must do" things on the Anthem of the Seas. Learn about more cruises from Cape Liberty (NJ). 7-night cruise to the Bahamas on Royal Caribbean Anthem of the Seas. Round-trip from Cape Liberty (NJ) to Port Canaveral (Florida), Perfect Day at CocoCay (Bahamas) and Nassau (Bahamas). • 2019 departures: November 2, November 9, November 16, December 1. • 2020 departures: February 23, March 1, March 8, March 15, March 22, March 29, April 5. 7-night cruise to the Bahamas on Royal Caribbean Oasis of the Seas. Round-trip from Cape Liberty (NJ) to Port Canaveral (Florida), Perfect Day at CocoCay (Bahamas) and Nassau (Bahamas). • 2020 departures: May 10, May 17, May 24, May 31, June 7, June 14, June 27, July 4, July 11, July 18, July 25, August 9, August 16, August 23, August 30, September 6, September 13, September 20, September 27, October 4, October 11, October 18, October 25. 8-night cruise to the Bahamas on Royal Caribbean Anthem of the Seas. Round-trip from Cape Liberty (NJ) to Port Canaveral (Florida), Nassau (Bahamas) and Perfect Day at CocoCay (Bahamas). • 2019 departures: November 23, December 20, December 28. • 2020 departures: February 7, February 15, November 13, November 21, November 29, December 19, December 27. 5-night cruise to Bermuda on Royal Caribbean Anthem of the Seas. Round-trip from Cape Liberty (NJ) to King's Wharf (Bermuda). • 2019 departures: May 4, May 18, June 1, June 15, June 29, July 3, July 27, August 10, August 24, September 7, September 21, October 5, October 19. 5-night cruise to Bermuda on Royal Caribbean Adventure of the Seas. Round-trip from Cape Liberty (NJ) to King's Wharf (Bermuda). • 2020 departures: May 30, June 13, June 26, July 10, July 24, August 8, August 22, September 5, September 19, October 3, October 17, October 31. 7-night cruise to Bermuda on Royal Caribbean Anthem of the Seas. Round-trip from Cape Liberty (NJ) to King's Wharf (Bermuda). • 2019 departures: April 13, April 20, April 27. 8-night cruise to Bermuda & the Bahamas on Royal Caribbean Adventure of the Seas. Round-trip from Cape Liberty (NJ) to King's Wharf (Bermuda), Nassau (Bahamas) and CocoCay (Bahamas). • 2019 departures: May 17, June 14, June 28, July 12, July 26, August 9. 9-night cruise to Bermuda & the Caribbean on Royal Caribbean Anthem of the Seas. Round-trip from Cape Liberty (NJ) to King's Wharf (Bermuda), St Maarten, Puerto Rico and Labadee (Haiti). • 2019 departures: May 9, May 23, June 6, June 20, July 4, July 18, August 1, August 15. 9-night cruise to Bermuda & the Caribbean on Royal Caribbean Adventure of the Seas. Round-trip from Cape Liberty (NJ) to King's Wharf (Bermuda), St Maarten, Puerto Rico and Labadee (Haiti). • 2020 departures: May 21, July 1, August 13. 6-night cruise to Canada & New England on Royal Caribbean Adventure of the Seas. Round-trip from Cape Liberty (NJ) to Bar Harbor (Maine), Saint John (New Brunswick) and Halifax (Nova Scotia). • 2019 departures: May 25, June 8, June 22, July 6, July 20, August 3, August 17, August 31. • 2020 departures: May 15. 9-night cruise to Canada & New England on Royal Caribbean Anthem of the Seas. Round-trip from Cape Liberty (NJ) to Boston, Portland (Maine), Bar Harbor (Maine), Saint John (New Brunswick) and Halifax (Nova Scotia). • 2019 departures: August 29, September 12, September 26, October 10, October 24. 9-night cruise to Canada & New England on Royal Caribbean Adventure of the Seas. Round-trip from Cape Liberty (NJ) to Boston, Portland (Maine), Bar Harbor (Maine), Saint John (New Brunswick) and Halifax (Nova Scotia). • 2020 departures: June 4, July 15, August 27, September 10, September 24, October 8, October 22. 10-night cruise to Canada & New England on Royal Caribbean Adventure of the Seas. One-way from Cape Liberty (NJ) to Quebec City (Canada). Visit Bar Harbor (Maine), Portland (Maine), Saint John (New Brunswick), Halifax (Nova Scotia), Sydney (Nova Scotia) and Charlottetown (Prince Edward Island). • 2019 departure: September 6, September 27. 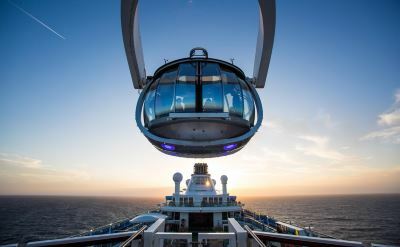 11-night cruise to the Caribbean on Royal Caribbean Anthem of the Seas. Round-trip from Cape Liberty (NJ) to Puerto Rico, St Maarten, Antigua, St Lucia and St Kitts. • 2020 departures: January 5, January 16, January 27. 12-night cruise to the Caribbean on Royal Caribbean Anthem of the Seas. Round-trip from Cape Liberty (NJ) to San Juan (Puerto Rico), Philipsburg (St Maarten), St Johns (Antigua), Bridgetown (Barbados), Castries (St Lucia) and Basseterre (St Kitts). • 2019 departures: March 3, December 8. 12-night cruise to the Caribbean on Royal Caribbean Anthem of the Seas. Round-trip from Cape Liberty (NJ) to Puerto Rico, St Maarten, Antigua, St Lucia, Barbados and St Kitts. • 2020 departures: December 7. 12-night Transatlantic cruise to England on Royal Caribbean Anthem of the Seas. One-way from Cape Liberty (NJ) to Southampton (England). Visit Ponta Delgada (Azores), Cork (Ireland) and Le Havre (France).